The most popular rifle sold by RWS, this German rifle will keep you shooting accurately and powerfully for decades. While it doesnt have some of the frills that more expensive guns have, it goes head-to-head where it really counts! 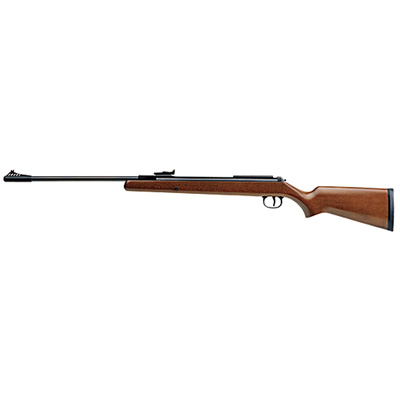 The well-balanced hardwood Monte Carlo stock makes it easy to hold and shoot the RWS 34, and the raised cheekpiece gives you that extra edge. Quality is evident in other places, too: a two-stage adjustable trigger, fiber optic sights (fully adj. rear) and a finely rifled barrel. No need to worry about cocking difficulty, as thats where this rifle really shines (just 33 lbs.). Both calibers are ideal for plinking, paper targets and spinners. Like to hunt? The .22 cal. should be your choice for small game and pests. If youre a serious airgunner on a budget, the RWS 34 was made for you!